I’m happy to tell you about a new eco-friendly cat litter on the market — Kitty’s Crumble. It’s different from all the rest since it literally falls from the sky. Yup. It comes from coconut husks (coir). Coir is earthy which cats love, but it’s also super absorbent, holding up to four times its weight in liquids that are disbursed evenly for kitty’s comfort. 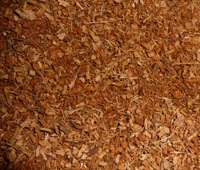 Coir also controls odor. Plus, Kitty’s Crumble has a very small carbon footprint. The centuries-old coconut groves are supported by rainfall, and the coconuts are collected by hand. They’re also grown without fertilizers or pesticides. The packaging is recyclable and filled to the very top (no wasted space). 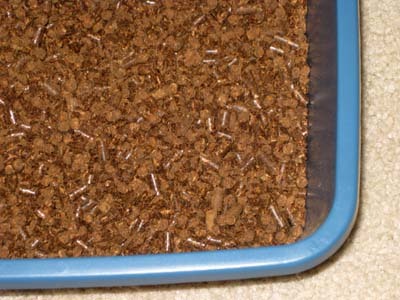 When you’re done with Kitty’s Crumble and the solid wastes have been removed, use it right away as a fertilizer or add to compost. 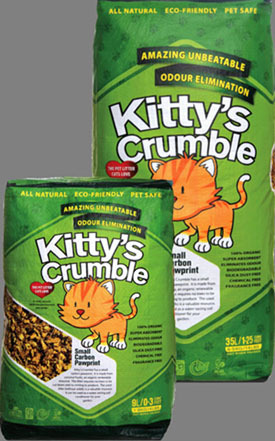 Kitty’s Crumble is giving away one bag of their cat litter to a Light Green Stairs reader. To enter, leave a comment on this post before 11 pm CST on Saturday, March 27. The contest is open to anyone with a cat and a continental US mailing address. The randomly selected winner will have three days to respond to my request for a mailing address, so please check your spam filters.